Its foliage is really impressive and dramatic – striped and dressed in beautiful color combination of green, cream and reddish-pink, besides being bold, spiky and marvelously symmetrical! That was what moved us to introduce it to our garden in early 2004. 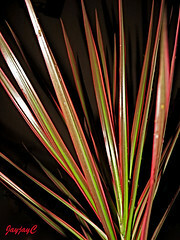 Moreover, Dracaena marginata ‘Tricolor’ is a sun-loving plant that is most suited for our tropical garden. A robust plant too that takes to hard pruning with a pinch of salt, producing more stems after each haircut and requires very minimal attention. Through the years, it stays happy and vibrant in a large pot, located at a sunny spot of our front yard, against a pillar that acts as its backbone whenever it gets too tall for its own good. Plant type: Ornamental shrub, first found in Japan and developed in Puerto Rico and Florida. Features: Dracaena marginata ‘Tricolor’ is one of the loveliest variegated cultivar of Dracaena marginata (Madagascar Dragon Tree) which is a member of the ancient Dragon Tree family originated from the Canary Islands. This evergreen tropical shrub has a fairly slow to medium growth rate. It is popularly favored for its magnificent foliage and can grow to approximately 2-5 meters tall and spreading about 1-2.5 meters wide. It has an upright growth habit, displaying long, slender and erect to somewhat curving stems in gray that are covered with distinctive leaf scars. Though stems are unbranched, but when cut back, new shoots will emerge and present an even nicer shrubby display with impressive and colorful foliage. Leaves that are 30-60 cm long, narrow, pointed and ribbon-like, are borne spirally along the stems and symmetrically arranged, appearing as a beautiful rosette atop the stems that become leggy as the basal leaves are shed. 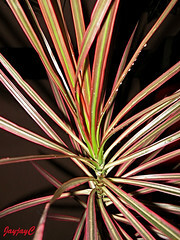 The attractive leaves are smooth-textured and striped in multi-colored tones of green with rosy-red or purplish-red margins and a cream center. 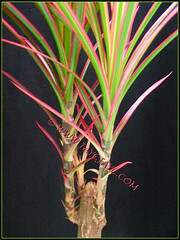 Red-edged Dracaena is known to bear white flowers though our 5-year old plants have yet to do so. 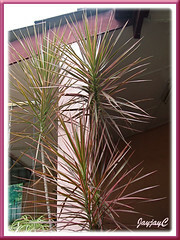 Culture (Care): Dracaena marginata ‘Tricolor’ can be easily grown with little maintenance. Light: Full sun (not scorching sunlight though) to light shade. Best leaf color in bright indirect sunlight or 2-3 hours of direct morning sun outdoors and indoors, bright light. Too little light causes loss of foliage color. Moisture: Moderate water. Though very drought tolerant, regular watering is beneficial and makes it happy, which include humid conditions too. Overwatering or underwatering can be problematic. Soil: Prefers fairly moist, fertile and well-drained soil though adaptable to a wide range of potting medium that include a sandy, clayey loam with a mix of peat moss. Others: Feed monthly with a liquid houseplant fertilizer. Remove discolored or drooping lower leaves by pulling downwards off the stem. Regular pruning is recommended to encourage bushiness as two or more branches emerge after a stem cut, as well as for aesthetic effects when leggy stems are pruned at varying desired heights to beautify its appearance. Trim back the tall stems to the level where you want branching and leaves to appear. It tolerates heavy pruning well and stems can be used for propagation too. 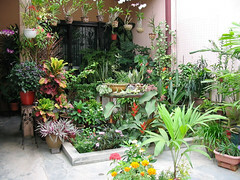 Usually, outdoor plants are hardly affected by pests or diseases, though indoor ones are occasionally bothered by scales, spider mites and mealy bugs. For subtropical regions: Hardiness: USDA Zone 10b-11. It tolerates some shade and cooler winter clime but not frost. Protect it from frost or overwinter indoors and during this period, reduce watering and withhold fertilizing or feed sparingly every two months. Pruning and propagating to be done in spring. Propagation: Can be propagated by tip cuttings or stem cuttings, as well as air layering. 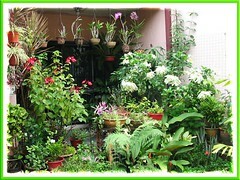 For tip cutting, take a healthy one and remove the bottom one-third of its leaves before planting into potting medium. For stem cuttings, take 2- to 3-inch long stem sections and lay them horizontally into potting mix and secure with bent wire or push them vertically into soil and firm the soil around them, the latter being the easier and popular method. 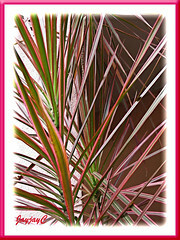 Sited at a warm and sunny area and with regular watering, new growth should appear. Another way to get more plants from old leggy Tricolor Dracaena is to prune down the tall stem to encourage 2-3 new growth to emerge as seen in the right image. When they reach a reasonable height, you can use the tip and stem cuttings to propagate new plants. Usage: Spectacular foliage plant that is suitable in a large container or raised planter, located outdoors in the garden, porch, patio and the like or indoors as a houseplant or to overwinter in freezing climate. Excellent too, when grown in the ground as an ornamental specimen or accent, or grown en masse in shrub borders, as hedges and screens. Great shrub for landscaping at parks and along roads and highways.